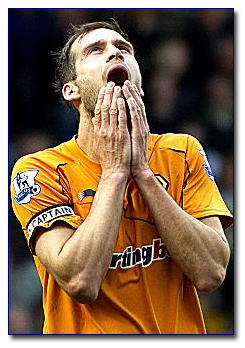 On the eve of tomorrow’s FA Cup third-round tie between Blues and Wolves, ex-Birmingham City defender Roger Johnson has revealed that his exit from St Andrew’s ‘was out of my hands’. The Wolverhampton Wanderers captain will return to his old stomping ground tomorrow for the first time since his £4.5million transfer to Molineux, and is eager for his side of the story to be told about his departure. The 28-year-old former Cardiff City player has revealed that he was told to find himself a new club following Birmingham’s relegation in order to ease Blues’ financial situation. Speaking to the Express & Star, Johnson said: “The club had been relegated and I was asked if I’d like to leave. “It wasn’t a case of me banging the door down saying ‘let me leave’. “They didn’t want to see their best players leave but, at the time, it was out of my hands. “They can’t come back to me and say it’s not true because I’ll beg to differ. They’re the reasons. No club was prepared to meet the Birmingham board’s evaluation for Johnson and he was finally allowed to leave for a cut-price £4.5m. This entry was posted in BCFC News and tagged bcfc, birmingham city football team, fa cup, roger johnson, wolverhampton wanderers. Bookmark the permalink.